Rapid Designs is among the nation’s leading product development specialists with extensive expertise in the application of Stereolithography (SLA) technology in rapid prototyping and rapid tooling. As a fully-integrated product development company, Rapid Designs draws upon a history of over 40 years of service to manufacturers of innovative products across the entire industry spectrum. Today, our expertise in the application of advanced digitally-driven rapid technologies is widely acknowledged in the marketplace. Symbolizing this leadership, in 2006 we were cited for exemplary performance by Raytheon, Inc. for achievements in digital rapid manufacturing of key components for an advanced mine-hunting sonar system. This recognition for achievement in the most demanding environment for precision and durability and dependability establishes Rapid Designs as one of the elite companies in the product development services sector. SLA emerged as the industry leader in form, fit and appearance applications. SLA still demands the leading position when it comes to holding close tolerances (<.05mm) and smooth surface finish. 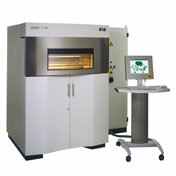 Its material properties are limited where robust or demanding performance applications are required. 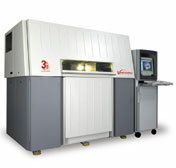 Stereolithography (SLA) has become the gold standard for rapid prototyping where fit and assembly is critical. It’s high accuracy and good surface finish makes it the preferred choice for designer models, engineering verification and master patterns for silicone rubber molds. As a free form fabrication technology it builds one layer at a time by tracing a beam of laser energy on the surface of liquid photo curable polymer. The photopolymer is a UV curable epoxy resin base system. Each layer is scanned exposing a section of the 3D CAD solid model. Layer thicknesses (Z vector) can be varied to increase or decrease the part resolution and quality. There is a movable platform inside a vat containing the photopolymer resin. The platform moves downward with the completion of each successive layer until reaching the top of the 3D part. With each subsequent layer a fresh layer of photopolymer resin flows across the part for the next scan sequence. Once the part has been fully scanned it is removed to a photo curing oven where it is exposed to UV light to complete the curing process. During the build process the part is supported by a network of vertical supports that are removed before placing in the curing oven. SLA parts after removal from the PC oven are then ready for post processing as required by the specific application. SLA parts can be vapor honed, bead blast or sanded to prepare for secondary finishing operations. Frequently, parts produced by SLA are used as master patterns (pattern transfer process). The pattern is transferred to urethane castings using silicone rubber molds (SRM) also known as RTVs (Room Temperature Vulcanization). The urethane castings are used in the customer's prototype or low-volume production applications. The SLA technology is extremely versatile and can be used in any application requiring a high degree of accuracy and surface quality. New composite photopolymers continue to be developed by resin manufacturers. These new resin systems are reinforced ceramic composites introducing nano-scale particle sizes. Composite resins offer enhanced stiffness and high heat deflection temperature (HDT 250oC) over unfilled resins, together with low shrinkage and ease of processing. New applications opportunities are promising. Rapid Designs has been pioneering SLA composites for rapid tooling and improved engineered part applications. 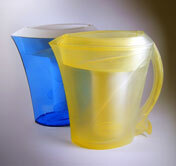 DSM Somos selected Rapid Designs as a beta in 2004 for it’s new line of composite SLA resins. Rapid Designs rapid prototyping specialists, after consulting with you and understanding your RP application, will help you select the most appropriate RP process. If functional prototypes, master patterns for silicone rubber molding, urethane castings, investment castings, concept tooling, bridge tooling, or prototype – low volume production injection molds are required, our team of professionals can offer a rapid solution that best meets your needs. We measure ourselves by the value we add to our clients and their projects. Click Here to Contact Rapid Designs for further assistance with your stereolithography needs.